People’s Art Foundation – A foundation dedicated to anyone who created anything ever.. Although India is a land of arts, very few people understand it’s significance. And that is due to lack of adequate government support and poor promotion of art beyond big cities. In 1872, George Sand, a French novelist, wrote that the artist has a “duty to find an adequate expression to convey it to as many souls as possible.” To put it more succinctly, art needs an audience. 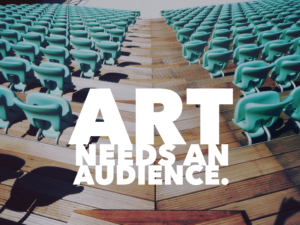 People’s Art Foundation works towards creating an audience for Artists. The idea is to create a connect. People’s Art Foundation is a system of connection and when you leverage the systems available to you to create enduring work, you create the kind of art that impacts a culture. You join the ranks of those who were able to change the world by being both creative and entrepreneurial. It’s a challenge, of course, to be both a marketer and an artist; People’s Art exists to bridge that challenge. The opportunity to do creative work that also pays the bills is unprecedented with the access we have to tools and technology those before us have never had.